Distributor: Currie Technologies, of Chatsworth, Calif. Hazard: The rear axle can break causing a rear wheel to detach, posing a fall hazard to the rider. Incidents/Injuries: The firm is aware of six incidents, including five reports of bruises and scrapes. Description: The recalled tricycles are battery powered with 24″ wheels and a basket between the rear wheels. Their brand name, eZip or iZip, is printed on the sides of the bike and above the front wheel. Bikes were sold in the following colors: red, blue and sand. Recalled tricycles are in the serial number range ACB06L00001 to ACB10H99999. Serial numbers are engraved on the frame under the handlebar support on the front of the tricycle. Model numbers include EZ-TRY-SD, IZ-TRY-RD, IZ-TRICR7-BL and IZ-TRY8-BL. 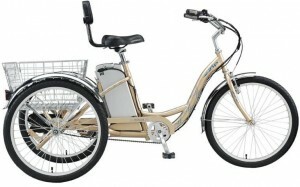 Sold at: Independent bicycle shops and electric bicycle shops nationwide and online at Walmart.com from March 2007 through March 2012 for between $850 and $1120. Remedy: Consumers should immediately stop using these tricycles and contact Currie Technologies to receive a free replacement component and repair.